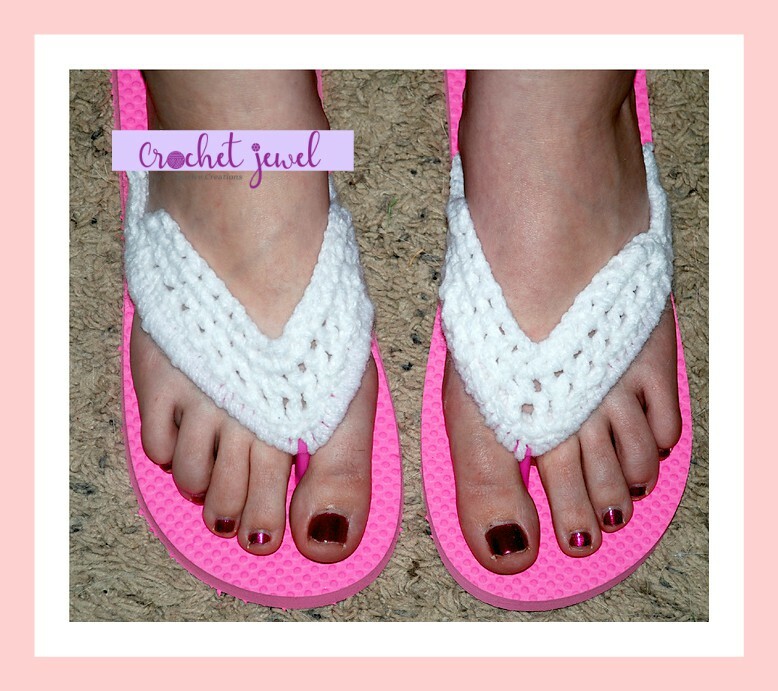 I made these Crochet Flip Flops with Some cute cheap flip flops and yarn! I bought the Flip Flops at Walmart for only 99 cents. I wanted to add a cute design to the sandal so I added a cute design around the strap! Flip Flops, I wear a size 9. Bought these for on 99 cents. Now if your foot is smaller, you can do less sc around the straps, or more if you have a larger size sandal. I would follow the pattern when it comes to how many hdc. Row 1: Start with a H hook, Slip knot onto your hook, wrap it around the strap of the flip flop at the end of the flip flop, sc 40 sc up to the top center thong part of the flip flop and sc 40 sc back down the strap. Fasten off. Row 4: sl st in the chain 1, Chain 3 (counts as dc and chain 1), *hdc in the next chain 1 space, chain 1, *Repeat that up and down both straps, Chain 3, sl st in the next sc. Fasten off. Weave in the ends.